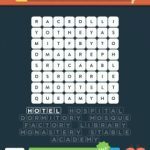 Stuck in Wordbrain 2 Buildings (Word Voyager 8×8). Here are the answers. Level 1–granary, apartment, hostel, college, brewery, bunker, temple, cottage, campervan.